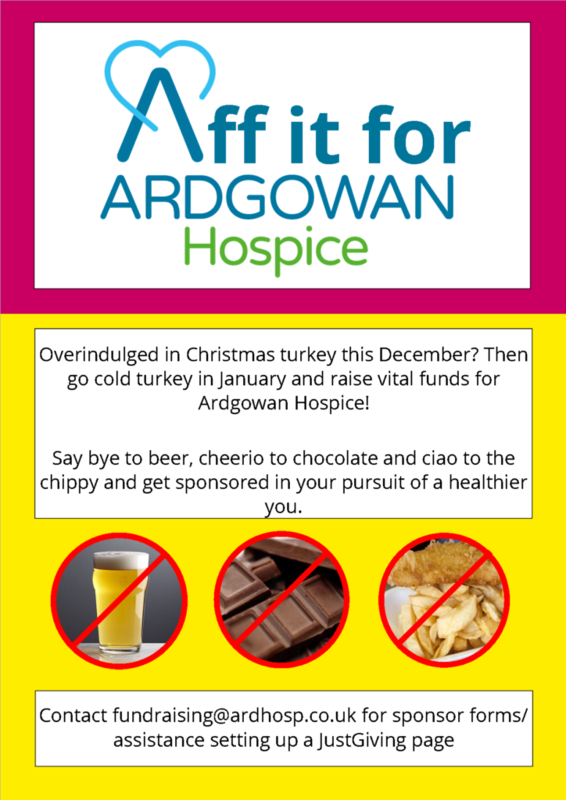 Home » Support your local hospice » Aff it for Ardgowan! We’re taking Sober October to the next level, we’re encouraging you all to go Aff it for Ardgowan! Ditch a vice this January* and raise vital funds for you local hospice. It doesn’t have to be alcohol – if you’ve been guzzling the sugary drinks, other doing the JustEat order on a Saturday night or eating too many biscuits during the working day, make a decision to say “No” and make a positive, healthy change in your life. Whether you want to stop smoking forever or just take a month off alcohol, this is your chance to improve your physical health while raising money for Ardgowan Hospice. We’ve had some incredible Aff it for Ardgowan success stories this year already. Lynda McCahill raised £600 by saying no to alcohol this October! She stuck to the orange juice through birthdays and engagement parties and raised enough money to fund 24 hours of care in our In-Patient Unit. Frank Shields also raised close to £600 that same month by swapping pints of beer for pints of water. Between Frank and Lynda they raised £1200 for Ardgowan Hospice, saved money and made a positive healthy impact in their own lives. Well done to Lynda and Frank! If you want to go Aff it for Ardgowan, just send an email to fundraising@ardhosp.co.uk or use this contact form and tell us what you want to quit. We’ll supply you with sponsor forms, any advice needed to set up a JustGiving page and of course and a lot of support and best wishes. *While we encourage you to go Aff It in January, you can take part any month you feel like making a difference in your life. You can even extend the time, we have a wonderful supporter going Aff It for an entire year to celebrate her 50th birthday!